The roads of Australia are home to some of the biggest heavy-duty trucking outfits in the world: tri-drive tractors haul 175-tonne four-trailer outfits on the same roadways used by your average motorcycle or car, making things interesting to say the least. The CP team does not limit their footage to the main roads, however, and this DVD will be sure to impress with shots of even larger machines working on isolated dirt tracks. 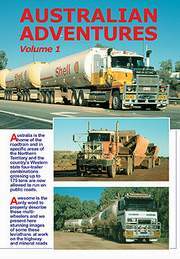 Featuring footage of the centenary celebrations at Alice Springs; shots of 600hp Macks and Volvos hauling fuel in from Darwin and Adelaide in three- and four-trailer fuel tank combos; the 10 x 6 FH16 tri-drive Volvos owned by the Giacci Brothers hauling four trailers of zinc concentrate to Port Geraldton; and E9-powered Macks and Cummins-powered C500 Kenworths pulling 16 foot wide twin-trailer trains loaded with gold-bearing ore.